Do you like vintage items? Perhaps maybe just vintage style? 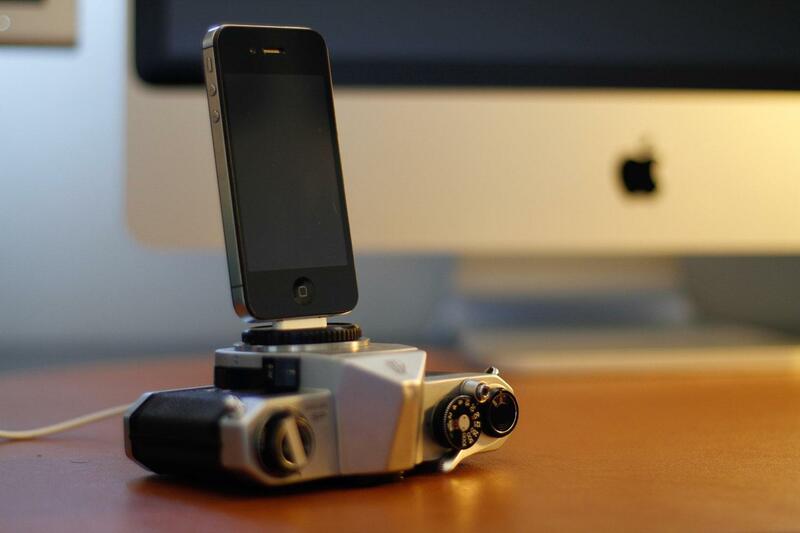 An Etsy seller has taken old film SLR cameras and converted them into iPhone charging docks, creating a unique and modern piece of technology out of something old and forgotten. Based in Santa Barbara, California, Roberto Altieri took various types of cameras, including a 1960’s Pentax and a 1970’s Minolta, and gutted the inside so they are compatible to charge your iOS devices. The camera-stand chargers both feature a 3-foot cord that plugs directly into a USB port. These one-of-a-kind chargers make a great gift for your favorite photographer friends who can appreciate the charm of old film cameras but need something up to date for their iOS gadgets. They are also beautiful pieces of art that you can proudly display when you’re charging your devices, rather than having the iPhone and iPod lay flat next to your laptop or power outlet. Unfortunately, although the iPad uses the same USB plug, it’s highly unlikely this dock will be able to withstand its width and weight. According to Altieri’s Etsy profile, he had always been a lover of photography, and did not want to see film cameras go to waste in a time where digital cameras are quickly replacing the inconvenience of film development. We kind of wonder where he got his hands on all these old cameras as they are becoming quite rare. Thrift stores do not often have these cameras anymore, and Craigslist can be hard to sort through. And at a sale price between $39 to $49 plus shipping, Altieri isn’t placing a huge markup for what old film cameras go for these days. At the time of publishing, Altieri has five of his unique film camera chargers up for grabs. We’re not sure if he will continue to scavenge for more cameras to convert, so if you’re in love with this quirky charging dock, you better get a move on it! Do you have old camera equipments that are no longer good for everyday use? If you’re feeling inspired, there are plenty of ways to upcycle your old gadgets and accessories. For example, this Photojojo tutorial will show you how to turn old camera lens into flower pots, adding some life to your otherwise dead gears. If you have a broken film SLR camera, you can also remove the lens, stick an LED or small keychain light inside, put the lens back on and you’ve got a film camera night light. Old cameras are also pretty heavy, so if you have no technical skills or have no patience to bother, just place them on either end of a shelf and create a vintage-style bookend. For more DIY projects related to photography, check out this list by Photojojo or discover fresh ideas from Instructables. Enjoy!